Hei, when I first saw the pictures, I thought it was petai too. i pun ingatkan petai tadi. lol! here i cannot eat petailah. takut toilet berbau! PJ, my mom said if you eat petai eat kali with terung. This way the toilet won't smell so bad. She even hang a terung kat tandas to eliminate the smell. You mom is way too funny. Gantung terung in the tandas to emliminate the petai smell. I will sure try that. 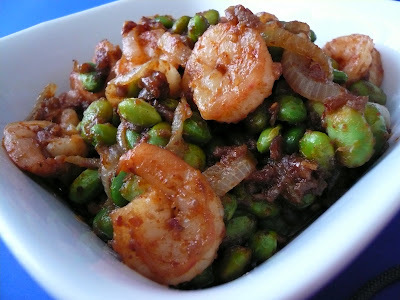 Your sambal udang with edamame looks so good. Ada bawang lagi. Sedap. Cat, she will do anything to eliminate the smell. Can you imagine the bau when all the 7 of us makan petai and used the tandas :) PENGSAN !! it works. Cat, cuba masak this dish. Sedap. Heh, this is the first time I hear about the terung. Must try ! This looks really easy and good. Will have to try this next! wah! gantung terung in the toilet? if u say it works, then nanti i boleh try. if not, kena spray the toilet every 10min. hahahaha..
Nonya, my mom did that long time ago. Jayden, thanks for dropping by. Gert, how she gantung the terung? Satu biji? Must cut first or in whole? This is the first time I heard of such petua. You should open up another blog for just petua.Very informative. BTW, I must try your recipe since I have edamame. 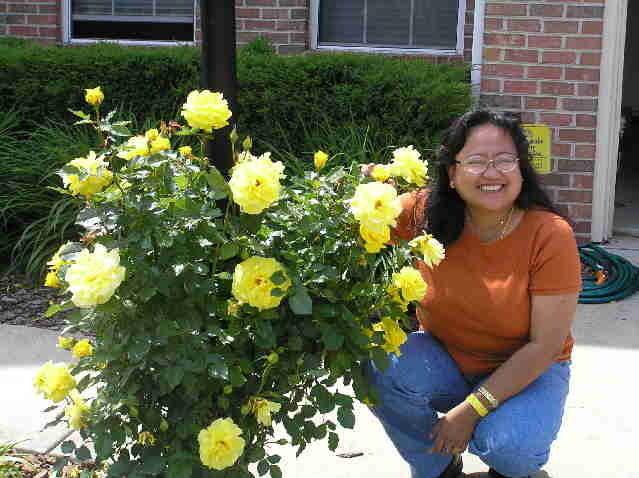 Gert...wau la..i love your presentation picture...of course la that meal is the main spot! !..what is u camera brand? ?.so clear and nice..Can use edamame to stir fry sambal udang also? ?.I only eat edamame steam with salt.In NYC supermarket,I saw petai sold there,100 gm for 1.50 only,,not bad..the petai color very hijau and look fresh..of course frozen.Since I never eat it,I dunno the different.Eat once when I was kid but don't like the taste. Zue, you slit a bit of the terung before hanging it up. But I think eating petai with terung works better. Good idea ah endamme to substitute with petai. Going to try that for my Dearie Suki and see what he say. hmmm it's kinda like sambal balado with petai and udang. I miss that food.